This Disclaimer shall govern the relationship between Mick’s IT Blogs (hereinafter alternatively referred to as “we”, “us”, or “our”) and the User (hereinafter alternatively referred to as “you” or “your”). The information contained on this blog is for information purposes only, and may at times not apply to your situation. 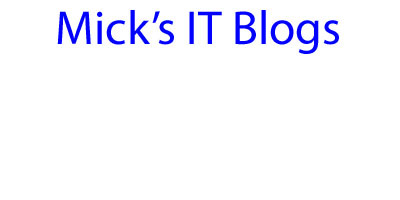 Mick’s IT Blogs provides no warranty about the content or accuracy of content provided by users. All information provided by Mick’s IT Blogs is tentative. We are not liable for any loss if you take the information as gospel truth. We accept no liability for the consequences of any action taken on the basis of the information provided, unless that information is subsequently confirmed in writing. Any views or opinions presented in Mick’s IT Blogs’ official website www.mickit.com are solely for guidance and do not necessarily represent facts. Mick’s IT Blogs contains scripts, applications and programs (hereinafter referred to as “scripts”) specifically written to automate and/or facilitate non-human interaction. Although the scripts work in Mick’s IT Blogs’ own computer environment, the same shall not be a guarantee that these scripts will have the same effect when presented in another corporate environment. Mick’s IT Blogs shall not be held liable for any improper or incorrect use of the information or services on this blog and assume no responsibility for anyone's use of the information or services found herein. Furthermore, Mick’s IT Blogs shall not be held liable for any direct or indirect damages caused in any way through the use of such information or the aforementioned services. Although an effort is made to assure the accuracy and completeness of the information provided in this blog, Mick’s IT Blogs makes no express or implied warranty as to the accuracy, adequacy, completeness, legality, reliability or usefulness of the information. Mick’s IT Blogs provides this information on an "as is" basis. While there may be changes to information on topics covered on the blog, these changes may or may not be made available therein. If you have obtained information about Mick’s IT Blogs from any unofficial source, be aware that content or services can be altered or changed after they are first made available. We recommend that you pay careful attention to the contents or any support data associated therewith, and you contact us regarding the data or information directly with any questions about data accuracy, timeliness or completeness before using the data. 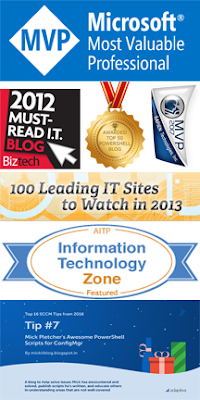 Mick’s IT Blogs may enter into partnership or affiliation with its sponsors and third parties. All opinions, advice, statements, services, offers, or other information or content expressed or made available by these sponsors and third parties are not those of Mick’s IT Blogs. The content does not necessarily reflect the views, policies or practices of Mick’s IT Blogs or its officers and employees. No employee or agent of Mick’s IT Blogs is authorized to conclude any binding agreement on its behalf with another user without express written confirmation coming from Mick’s IT Blogs’ owner, or any of the latter’s authorized representatives. Any views or opinions presented in this blog are solely those of the authors and do not necessarily represent those of Mick’s IT Blogs. Employees of Mick’s IT Blogs are expressly required not to make defamatory statements and not to infringe or authorize any infringement of copyright or any other legal right by email communications. Any such communication is contrary to company policy and outside the scope of operations. Mick’s IT Blogs will not accept any liability in respect of such communication, and the employee responsible will be personally liable for any damage or other liability. In no event will Mick’s IT Blogs be liable for any loss or damage including, without limitation, indirect or consequential loss or damage, or any loss or damage whatsoever arising from loss of data or profits arising out of, or in connection therewith. Through this blog, there are instances when you are able to link to other websites which are not under the control of Mick’s IT Blogs. We have no control over the nature, content and availability of those sites. The inclusion of any links does not necessarily imply a recommendation or endorsement of the views expressed within them. The blog content services provided by Mick’s IT Blogs are not an implied admission of liability or acceptance of responsibility on its part for all damages and expenses which may arise as a result of the rendition of such services. Neither Mick’s IT Blogs nor any of its affiliates, directors, officers, employees, agents, contractors, successors or assigns shall be liable for any loss or damage whatsoever arising out of, or in any way related to, the use of or reliance upon this blog, and any other website linked to this blog, including any direct, indirect, consequential, special, punitive or other damages that you or others might suffer, including but not limited to damages for loss of profits, business interruption or the loss of data or information. Furthermore, we cannot guarantee that any file or program available for download from or via our blog is free from virus or any other condition which might or could damage or interfere with data, hardware or software with which it might be used, and in accessing this blog, you assume all risk of use of all programs and files on this blog, and you release Mick’s IT Blogs and their respective affiliates, directors, officers, employees, agents, contractors, successors and assigns entirely from all responsibility or liability for any consequences of or arising out of your use of this blog. In the event you share any information or data taken from Mick’s IT Blogs, you hereto agree to defend, indemnify, and hold us harmless from all claims and expenses, including attorney’s fees, arising from any misinformation that may cause damage or injury to third parties. Mick’s IT Blogs shall not be responsible for the aforementioned consequences of your acts. Furthermore, you free Mick’s IT Blogs from liability for any offensive or illegal conduct which you may have committed to third parties and that the risk of injury from all these rests entirely upon you. Given this Disclaimer, you acknowledge and agree that you will not sue or initiate against Mick’s IT Blogs any action or proceeding, or participate in the same, individually or as a member of a class, under any contract (whether express or implied), law, or regulation, federal, state, or local, pertaining in any manner whatsoever to the claims you release herein. The claims which are disclaimed, waived, released and discharged include, but are not limited to, breach of express or implied contract; breach of the covenant of good faith and fair dealing; intentional and negligent infliction of emotional distress; public policy torts of any kind or nature; or any other reason prohibited by applicable law; and claims under US laws and regulations. By executing this Disclaimer you hereby release and discharge Mick’s IT Blogs from any and all liability, and waives any and all rights of any kind and description that you may have against us as of the date of this Agreement, including, but not limited to, any asserted and unasserted claims, demands, debts, contracts, expenses, causes of action, lawsuits, damages and liabilities, of every kind and nature, in law or equity, arising from or in any way related to the blog. You likewise knowingly, voluntarily, and irrevocably releases and discharges the people, personalities and individuals behind Mick’s IT Blogs, including but not limited to our agents, representatives, employees, predecessors, successors, other corporate affiliates, and assigns from any and all claims, demands, liabilities, judgments, damages, expenses, or causes of action of any kind or nature whatsoever which you, your heirs, personal representatives, and assigns, and each of them, may now or hereafter have or assert, whether now known or unknown.